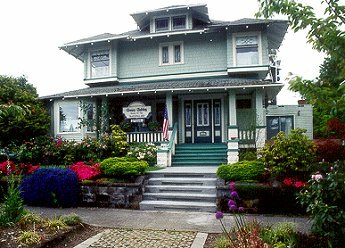 Located on the height of Queen Anne Hill, Green Gables Guesthouse bed and breakfast is just two miles northwest of the heart of downtown Seattle. The bed and breakast has an ideal location with good bus service and easy walking distance to the Space Needle, performing arts, area restaurants and the Experience Music Project Museum. Featuring eight room, six with private bath. We have two spacious suites. Off-street parking is available. We serve a bountiful full breakfast every morning with robust Seattle coffee -- roasted right in our neighborhood -- to put you in the spirit to get out and explore. First night paid deposit required. Non-refundable if unable to re-book. Credit vouchers gladly offered if unable to rebook, good for future stays. All nights non-refundable seven days prior to arrival. Children five years and older please. No pets. We have a front covered verandah for those who wish to smoke.